Tijuana - the final resting point for Central American migrants on a grueling journey for the prospect at a better life in America. A city that until recently, received little to no media attention for its growing immigrant population. A population that contrary to popular belief - has been present for over a decade. Throughout November and December of 2018 - over 7,000 refugees fleeing from violence and economic hardship in their home countries - arrived in Tijuana. This surge in migration, brought with it the attention of the international community - most notably the United States. With Trump eager to build the border wall as promised, and ultimately secure a second term in office - anti-immigration sentiment could not be stronger in US politics. In the middle of this US-Mexico sociopolitical polarization sit the volunteers, NGO’s, and Tijuana locals that chose to step up and help amidst the chaos. “I don’t care where they came from. They still need help, and I’m going to help them” - said World Central Kitchen volunteer and Tijuana local Oscar Montano. Despite strong resistance from the local Tijuana community - Mexico is choosing to stand by the migrant community by providing shelter, access to non-profit/government relief services, and (slow) asylum processing…for now. With unending pressure from the US, a strain on the local and federal economy, uncertainty at the border, and two communities depending on it’s stability - how long will that last? Kevin Hernandez, 19, of Honduras sits in the Barretal migrant facility 20 minutes outside of Tijuana. Kevin lived in Houston for 4 years before being deported back to Honduras. Upon arriving back to his home country - his father and older brother were killed in organized gang hits. Soon after, he departed with his 17 year old brother on the two month journey to the border. Now they just wait for their paper’s to be processed. While his younger brother has a good chance at asylum - Kevin’s chances of re-gaining legal entry to the United States after already being deported once are slim to none. A boy scooters by a tent spray painted with the text “Abolish ICE” in the Barretal migrant camp located 15 miles outside Tijuana, Mexico. This section of the camp houses woman, children, and elderly. Many of the families have been waiting for their papers to process for over two months. Others leave days after arriving, with hopes of illegally crossing the border in search of asylum. A man receives rudimentary medical attention from other refugees while waiting over 25 minutes for emergency services to arrive. He began seizing and vomiting due to a lack of medication according to responders on scene. Medical services were suspended in the facility several days prior in an effort to close the compound. Care from independent non-profits slipping past the police-guarded entrances is all that remain. Recent complaints from community members in Central Tijuana have lead to the government relocating migrant camps to low-income suburban communities on the outskirts of Tijuana. David Zuniga, 2, of Honduras, sits on a dinner table in the Barretal migrant camp located 20 minutes outside of Tijuana. Three meals a day are provided by local volunteers, churches, or international non-profits. David is covered by a dinner served moments earlier by World Central Kitchen - Chef Jose Andres’s global hunger non-profit. The group of volunteers has been serving 1,200-1,400 meals two time a day since December 5th 2018. Children in the Barretal migrant camp prepare to serve lunch to over 1,200. Three meals a day are provided by local volunteers, churches, or international non-profits. These children help World Central Kitchen (Chef Jose Andres’s global hunger non-profit) serve every day. The group of volunteers has been serving 1,200-1,400 meals two time a day since December 5th 2018. Honduran refugees freestyle rap to IPhone beats using a donated mic and speaker set-up at the Barretal refugee camp located on the outskirts of Tijuana. Tents pack the inside of a dimly lit abandoned warehouse space re-purposed as the Barretal migrant compound just outside Tijuana, Mexico. The Mexican government relocated over 2,000 refugees to this facility after the first camp in Central Tijuana was closed due to intense rain, flooding, and inhumane conditions. This sheltered part of the facility houses around 500-600 woman and children - while the remaining 1,500 single men sleep in donated tents in a gated area just outside. A man receives medical attention from emergency services after waiting for over 25 minutes. He began seizing and vomiting due to a lack of medication according to emergency responders on scene. Medical services were suspended in the facility several days prior in an effort to close the compound. Care from independent non-profits slipping past the police-guarded entrances is all that remain. Recent complaints from community members in Central Tijuana have lead to the government relocating migrant camps to low-income suburban communities on the outskirts of Tijuana. Kevin Hernandez, 19, of Honduras, rolls up his sleeve to show off the tattoos he got several years prior. The numbers hidden by the camp passes on his wrist is the area code of his family home in Honduras. The "H" directly above it (on his forearm) represents pride for his home country. Despite the gang turmoil tearing his neighborhood apart - he says he "misses Honduras", and "wishes he could return to be with his mother". A child and her grandmother peer out of their tent to watch children playing outside. The Barretal camp now houses between 1,500 and 2,000 migrants - with 30-40 leaving and coming each day. A man attempts to calm an angry crowd of refugees after a fellow camper was arrested for selling cigarettes to minors. The crowd began following police out of the facility after the arrest was made. They were stopped at the front gate - and eventually coerced that cooperation and peace was the best course of action. Moments later the majority of the gathering crowd dispersed - while a small group of 10-15 left to protest the arrest outside the police barracks. World Central Kitchen project leader, Sam Bloch, unpacks several boxes of apples to serve with lunch at the El Chinchetta compound in Central Tijuana. World Central Kitchen is supported by private donations and the hard work of volunteers. The non-profit hopes to facilitate a refugee-operated kitchen - enabling the operation to continue well after World Central Kitchen leaves the area. Refugees from the male portion of the compound eagerly wait their turn to enter the family side of the facility for dinner. Each night World Central Kitchen served between 1,200 and 1,500 meals. The line stretched over 100 yards in the other direction. Refugees have a makeshift dance party using a donated speaker + microphone set. A Honduran refugee gives out sandwiches prepared by World Central Kitchen in the Barretal refugee camp located just outside of Tijuana, Mexico. Brenden Darby, 28, of San Francisco cooks over 30 pounds of beef in the World Central Kitchen headquarters in Tijuana. The meat will be served as part of dish for dinner at the Barre Tal refugee camp. World Central Kitchen, Chef Jose Andres’ non-profit relief organization, serves over 1,200 meals 2-3 times each day. The sandwich contents total out at 3,600 pieces of ham and 2,400 pieces of cheese. The organization began serving on December 5th, and recently surpassed 50,000 meals served on the 18th. A child sits amidst the hundreds of tents packed into the Barretal compound on the outskirts of Tijuana, Mexico. 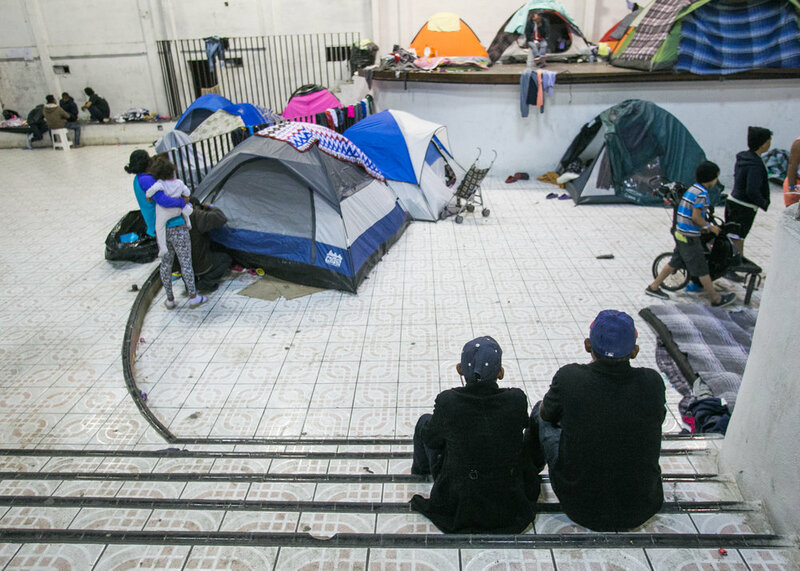 The Mexican government relocated over 2,000 refugees to this facility after the first camp in Central Tijuana was closed due to intense rain, flooding, and inhumane conditions. This sheltered part of the facility houses around 500-600 woman and children - while the remaining 1,500 single men sleep in donated tents in a gated area just outside. A refugee and kitchen volunteer serves lunch to over 1,500 at the Barretal camp in Tijuana, Mexico. Each day, 5-6 children from the camp assist World Central Kitchen with serving lunch and dinner. The goal of the program surrounds creating a sustainable refugee-operated kitchen in Tijuana to serve for months (or even years) to come. The recent influx in caravan activity has drawn mass media attention - but contrary to popular belief - refugees from Central America have been arriving in Tijuana for over a decade. Men gamble with dice on the ground of the Barretal refugee compound located just outside Tijuana, Mexico. Gambling, soccer, and card games are among the most popular activities to pass the time. Volunteer and San Diego artist, Robert Marquez, stands outside the El Chinchetta refugee compound in Central Tijuana. Robert beautifies these temporary living spaces by painting sheets that he hangs on the walls. Two young boys lift their sibling’s baby stroller up a set of stairs in the Barretal refugee camp. The camp is not handicapped accessible. Renovations were not possible due to the last-second nature of the migrant caravan relocation. Over 3,000 refugees were moved to other facilities after the main camp at a Tijuana baseball field was flooded out in late November. A volunteer serves dinner to over 1,500 refugees at the Barretal refugee compound. Each day, 5-6 children from the camp would assist World Central Kitchen with serving lunch. The goal of the program surrounds creating a sustainable refugee-operated kitchen in Tijuana to serve for months (or even years) to come. The recent influx in caravan activity has drawn mass media attention - but contrary to popular belief - refugees from Central America have been arriving in Tijuana for over a decade. A child strikes a pinnate with joy after six were donated for the many children occupying the Barretal refugee camp in Tijuana. A refugee child holds a bag of candy he recently procured from a donated piñata. Despite a great deal of healthy home-cooked food being served at the camp - the majority of the campers (including adults) are more enthusiastic about candy, chips, and other name brand items. Johnathan Torres, 10, of Honduras, serves dinner to over 1,500 refugees. Each day, 5-6 children from the camp would assist World Central Kitchen with serving lunch. The goal of the program surrounds creating a sustainable refugee-operated kitchen in Tijuana to serve for months (or even years) to come. The recent influx in caravan activity has drawn mass media attention - but contrary to popular belief - refugees from Central America have been arriving in Tijuana for over a decade. Children play soccer in the main section of the Barretal refugee camp located just outside of Tijuana, Mexico. Siblings play on the dinner tables of Barretal refugee camp in Tijuana, Mexico. Federal Police approach a skirmish between local police and a refugee being accused of selling cigarets to minors. The accusations caused a uproar in the camp. Many began chanting of unfair treatment - and the need to remove a police presence from the compound. After the man was arrested, human rights organizations became involved, and removed police to the exterior. 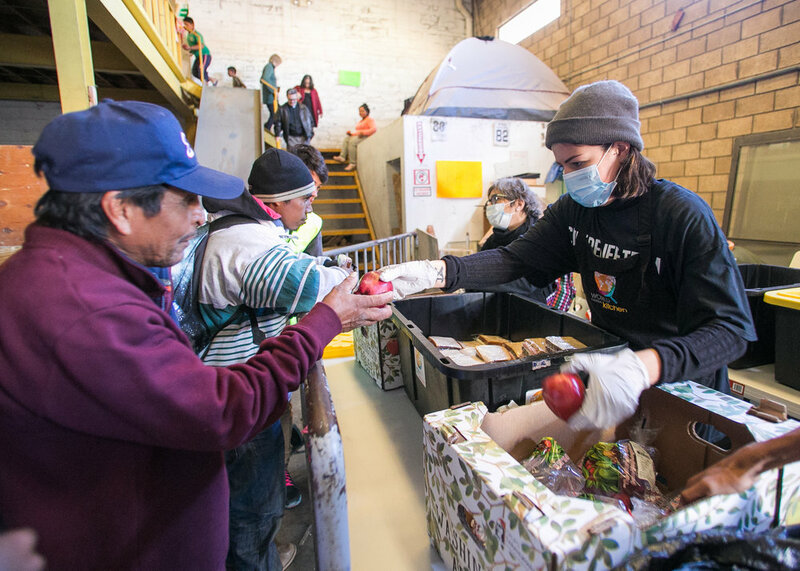 World Central Kitchen volunteer, Ocar Montana, 22, of Tijuana, unloads loafs of bread from a box truck at the WCK headquarters. Three meals a day are provided by local volunteers, churches, or international non-profits. A line of refugees waiting for food snakes into the street outside the El Chinchetta compound in Central Tijuana. Due to complaints from the local community - food, donation, and medical services were suspended in an effort to encourage those seeking refuge there to leave. Local government officials are receiving pressure to re-locate refugees to the outskirts of the city - away from the public eye, and higher income neighborhoods. An illuminated tent is silhouetted against the night sky in the Barretal refugee camp outside of Tijuana, Mexico. Tents are packed into every section (even on the rooftops) of the overcrowded Barretal refugee camp located outside of Tijuana, Mexico. A child watches on as volunteers from World Central Kitchen prepare dinner at the Barretal refugee camp. Tents line the second story of the El Chinchetta refugee compound in Central Tijuana. The building is home to 300-400 Central American migrants. Due to complaints from local residents, all medical, food, and donation services were suspended last week in an effort to re-locate the refugees, and close the facility. Jorgo Avisai Perdomo, of Honduras, leans against an old pallet provided by nonprofits to prevent refugees tents from flooding in the intense rain. The previous camp was closed after massive storms rendered the facility inhabitable. Jorgo has been traveling for two months. A cild watches on as volunteers from World Central Kitchen prepare dinner at the Barretal refugee camp in Tijuana, Mexico. A World Central Kitchen volunteer chops potatoes in preparation for dinner at the new World Central Kitchen headquarters in Tijuana, Mexico. The donated kitchen was once a famous restaurant known for being the birthplace of the burrito. Now it houses 10-15 volunteers, two chefs, and project coordinator Sam Bloch coordinating, preparing, delivering, and serving lunch and dinner for over 1,200 refugees. Laundry dries next to a Christmas tree that was recently donated to the Barretal refugee camp in Tijuana, Mexico. Many families have been waiting for over two months - and will spend Christmas in the compound. Brenden Darby, 28, of San Francisco loads bread into a box truck at the World Central Kitchen headquarters in Tijuana. The bread will be served as part of lunch at the Barre Tal refugee camp. World Central Kitchen, Chef Jose Andres’ non-profit relief organization, serves over 1,200 sandwiches each day. The sandwich contents total out at 3,600 pieces of ham and 2,400 pieces of cheese. The organization began serving on December 5th, and recently surpassed 50,000 meals served on the 18th. Volunteer, Rodrigo Rodriguez, of San Diego, hands out toys to refugee children in the Barretal camp located in Tijuana, Mexico. Rodrigo also purchased a washer and dryer for the facility. Refugees play soccer in the single male section of the Barretal border camp located just outside of Tijuana, Mexico. A child strikes a piñata with joy after six were donated for the many children occupying the Barre Tal refugee camp in Tijuana. World Central Kitchen volunteers chop potatoes in preparation for dinner at the new World Central Kitchen headquarters in Tijuana, Mexico. The donated kitchen was once a famous restaurant known for being the birthplace of the burrito. 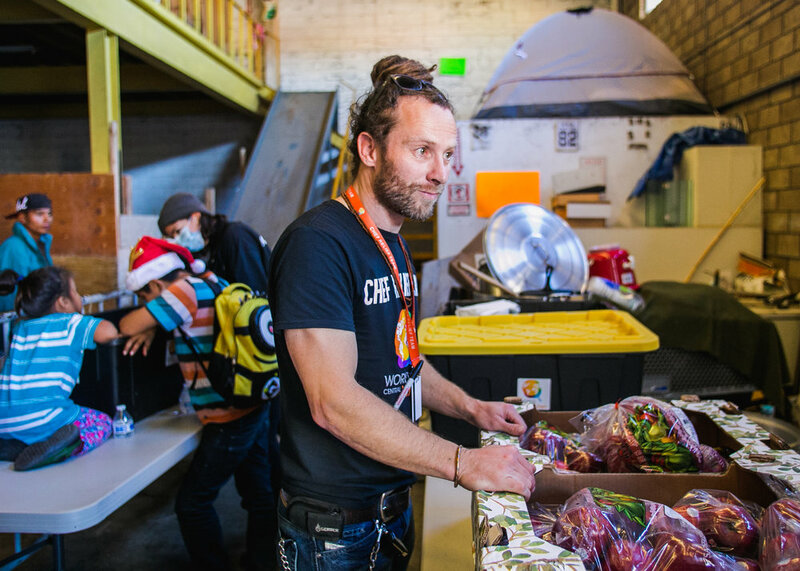 Now it houses 10-15 volunteers, two chefs, and project coordinator Sam Bloch coordinating, preparing, delivering, and serving lunch and dinner for over 1,400 refugees. Over 1,200 sandwiches are prepped for lunch by World Central Kitchen volunteers. A refugee smiles during a mid-day piñata party at the Barretal camp located in Tijuana, Mexico. A volunteer serves lunch to over 1,500 refugees at the Barretal refugee compound. Each day, 5-6 children from the camp would assist World Central Kitchen with serving lunch. The goal of the program surrounds creating a sustainable refugee-operated kitchen in Tijuana to serve for months (or even years) to come. The recent influx in caravan activity has drawn mass media attention - but contrary to popular belief - refugees from Central America have been arriving in Tijuana for over a decade. A refugee cleans the floors of the family section inside the Barretal compound located in Tijuana. Mexico. A volunteer and occupant of the El Chinchetta facility helps serve lunch to over 1,500 refugees. Each day, 5-6 children from the camp would assist World Central Kitchen with serving lunch. The goal of the program surrounds creating a sustainable refugee-operated kitchen in Tijuana to serve for months (or even years) to come. The recent influx in caravan activity has drawn mass media attention - but contrary to popular belief - refugees from Central America have been arriving in Tijuana for over a decade. Volunteers serve dinner to over 1,500 refugees. Each day, 5-6 children from the camp would assist World Central Kitchen with serving lunch. The goal of the program surrounds creating a sustainable refugee-operated kitchen in Tijuana to serve for months (or even years) to come. The recent influx in caravan activity has drawn mass media attention - but contrary to popular belief - refugees from Central America have been arriving in Tijuana for over a decade. Friends watch on as refugees have a makeshift dance party using a donated speaker and microphone set. Project Leader, Sam Bloch, serves dinner to refugees living in the El Chinchetta compound in Central Tijuana. A young Honduran refugee sporting a Steelers sweatshirt eats an apple provided by World Central Kitchen at the El Chinchetta refugee compound in Central Tijuana. A World Central Kitchen volunteer serves refugees in the El Chinchetta compound located in Central Tijuana. Brenden Darby, 28, of San Francisco cooks over 20 pounds of beef in the World Central Kitchen headquarters in Tijuana. The meat will be served as part of dish for dinner at the Barre Tal refugee camp. World Central Kitchen, Chef Jose Andres’ non-profit relief organization, serves over 1,200 sandwiches each day. The sandwich contents total out at 3,600 pieces of ham and 2,400 pieces of cheese. The organization began serving on December 5th, and recently surpassed 50,000 meals served on the 18th. A man is carried out of the El Chinchetta refugee compound in Central Tijuana. He began seizing and vomiting due to a lack of medication according to responders on scene. Medical services were suspended in the facility several days prior in an effort to close the compound. Care from independent non-profits slipping past the police-guarded entrances is all that remain. Recent complaints from community members in Central Tijuana have lead to the government relocating migrant camps to low-income suburban communities on the outskirts of Tijuana. A man receives rudimentary medical attention from other migrants while waiting for emergency services. He began seizing and vomiting due to a lack of medication according to responders on scene. Medical services were suspended in the facility several days prior in an effort to close the compound. Care from independent non-profits slipping past the police-guarded entrances is all that remain. Recent complaints from community members in Central Tijuana have lead to the government relocating migrant camps to low-income suburban communities on the outskirts of Tijuana. Oscar Montana, a volunteer from a local Tijuana university, prepares dinner at the World Central Kitchen Headquarters. Tijuana pastor and volunteer Leopold Perez helps make dinner for the Barretal refugee camp in the World Central Kitchen Headquarters.